Britax Emblem was originally introduced as part of what was called the Essentials line from Britax, along with the Britax Allegiance, as a more economically priced options. 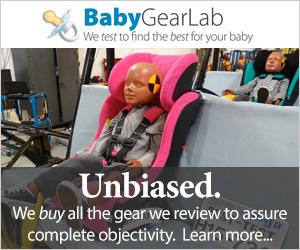 And, we consider the Emblem to deliver on that promise with excellent crash test performance and a more affordable price tag than Britax's most expensive seats. In fact, the Emblem and Allegiance performed so well in our testing that we don't see why people should pay more for the higher-end seats (which actually performed worse in our crash testing). The Emblem is a nice seat with more padding and softer fabric than the Allegiance. It has push-button style LATCH connectors and a non-rethread harness system that works well. This seat is easier to install using LATCH, but neither method is complicated. It earned the highest score for ease of use, and the crash test results are just below the best indicating it provides an additional margin of protection over the average seat. Because of the increased difficulty with installation, this may not be the best choice for families worried about installation. However, given the impressive performance all around and crash test results, we think that if you are willing to seek assistance with the installation that this is an excellent seat with a very reasonable price tag. Britax got started in Europe over 70 years ago. They launched in the US in 1996 and quickly become one of the more popular brands of safety seats and strollers on the market. Britax strives to create products that help families live life to the fullest and their baby gear line up includes strollers car seats and most recently the addition of BOB jogging strollers. The Britax Emblem (in blue) is a new car seat by Britax that is wallet-friendly and very similar to some now retired Britax options that were not ClickTight. The sections below include performance information on how the Britax Emblem performs when compared to the competition. The Emblem uses EPP foam for impact absorption. This type of foam does not off-gas and is somewhat more flexible than the traditional EPS foam. The Emblem had excellent performance in our crash testing and earned an 8 of 10, just one point below the high for the metric. One thing that is really interesting is that the lower cost Britax seats have consistently offered better crash test performance than their more expensive seats. The Emblem handily beat out the higher-end Britax seats like the Britax Advocate which only earned a 4 of 10 for crash test results. While all of the seats sold in the US must pass the same Federal guidelines FMVSS 213 and are therefore considered safe, our tests reveal that some offer a potential additional margin of safety compared to the competition. The Emblem is one such seat. The head sensor (HIC) results from the crash dummy for the Emblem are shown in the comparison graph below against the best HIC score in the group earned by the Britax Allegiance. The Emblem results were 218 while the Allegiance results were 186. The results need to be under 1000 to meet the requirements and the lower the scores the better. The Emblem earned an impressive result for the head sensor but had trouble keeping up with the impressive results of the Essentials by Britax Allegiance. The Emblem continued to earn impressive results with the chest sensor in the crash test dummy but once again it couldn't keep up, this time with the Clek Foonf. The chest sensor on the Emblem showed results of 42 where the maximum allowed is 60 and a lower result is better. The comparison chart shows the Emblem results against the Clek Foonf that has results of 33.4 where the lower number is better. The overall combine test results indicate that the Emblem potentially offers an additional margin of protection compared to the competition. Something every parent can get behind. LATCH installation is the easiest method for the Emblem with an 8 of 10 score for this metric. While some are easier thanks to unique and helpful LATCH designs, this is a more traditional and straightforward method that works well but still requires that you do the work. The LATCH connectors are the button push style that we believe are easier to operate than the clip style. The LATCH connectors are the button style that push on to the car anchors and release with just a push of a button. We find these easier to manage with the button than the clip style you need to press and turn to remove. Parents can find the best angle for installation using the angle adjustment lever under the seat bottom (above left) and the level indicator on the seat bottom side (above right). The Emblem earned an average score for ease of installation using the vehicle belt. The Emblem earned a 7 for 10 this type of installation. Nine competitors earned higher scores but it is still straightforward and uncomplicated. Forward-facing installation includes running the belt through a path in the seatback (above left) and using the side belt lock-off (above right) to stabilize the seat on the belt. The lock-off is easy to use and doesn't require much strength or any assistance from outside tools. Rear-facing installation runs the vehicle belt through a pathway in the foot of the seat or seat bottom (above left). It also has an easy to use lock-off (above right) that prevents the seat from moving along the belt while you are traveling. The Emblem harness assembly, headrest slides up and down to change the shoulder strap height. The Emblem is easy to use and earned a top score for this metric with an 8 of 10. The features and functionality of the Emblem are intuitive, simple, and work as they should. The Emblem buckle and chest clip are easy to use with one hand. The Emblem has a non-rethread harness adjustment which is our favorite. It is easy to use, can be moved with your child in the seat and ensures you get a good fit every time. The harness has ten height positions with two positions for the crotch strap. The Emblem cover has Velcro on the sides where you can secure the harness in an open position so you won't need to search under your baby to retrieve the straps. The buckles and chest clip work well and can be managed with one hand. The harness can be fastened to the seat of the seat with Velcro to help keep the harness out of the way when you place baby in the seat. It is a cool feature, but honestly, we suspect most parents will stop using it after a few months. The harness release button on the Emblem is located under the cover which helps to prevent little ones from messing with the button. The base of the seat has a tightening strap and release button on the foot of the product that both are easy to operate and unlike some of the competition the tightening strap doesn't require excessive force to use. The LATCH connectors store on the base of the seat and the excess straps are contained with a band (above left). The user manual stores behind the fabric on the seat back. The location is marked with a tab (above right) and is out of reach of little ones, but it could get soiled if children spill items or get sick in their seat. The Emblem's cover is removable and interchangeable with the now retired Britax Marathon G4.1. The cover needs to be hand washed and line dried. While this is more work than the few we found with machines washable seats, it is better than spot clean only given little ones tend to make a mess. The Emblem is an economical seat that is both comfort and good quality. Like most items made by Britax, this product uses quality materials that create a final good looking product. The Emblem earned an 8 of 10 for quality and comfort which is the second highest score for this metric. The shell of this seat is mostly contained and the bottom is smooth for less risk of vehicle damage over time. It has a sleek look to it with dense foam padding and softer more durable feeling fabric than the less expensive Britax Allegiance. The Emblem bottom has a rubber rim to help prevent slipping and there are no rough edges that could potentially damage vehicle seats. The Emblem manages to bring together a well-designed seat with few nooks and crannies without adding excessive weight that could make the seat cumbersome or hard to manage. The thicker more pronounced headrest wings could make this item more comfortable for napping. Compared to the competition the Emblem is lighter and slimmer compared to many products we measured. The Emblem is a relatively lightweight option earning a 6 of 10 along with the Britax Allegiance. It weighs 18.8 lbs which is significantly less than the Britax ClickTight products that weigh around 26 to 29 lbs depending on the model. While you may not be moving your seat very often, if you live the city this could be a regular occurrence for you and more important in your search for a convertible seat. Lighter seats are hard to come by and most did not score that well overall. It is fairly narrow compared to some of the competition, with a width of 18.9 inches. You may not be able to get three of these seats across a back seat, but it is better than much of the competition in this review. Britax also offers the Britax Allegiance. The Allegiance won a Best Value award in this review with a cost of only $200, better crash test results, and great performance for both ease of use, and quality and comfort.